Gary Brock | AIM Media photo Associate Director of Extension at Central State University, Clarence Bunch, center, talks with EFNEP Cooperative Extension Coordinator at CSU Mary E. W. Kershaw, left, at the CSU Extension booth during the Ohio Ecological Food and Farm Association conference Feb. 16, while CSU Montgomery County Extension agent Kevin McGhee, at right, talks with a conference attendee. 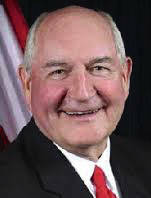 WASHINGTON D.C. — U.S. Secretary of Agriculture Sonny Perdue’s third “Back to Our Roots” RV tour next week will include stops in three Ohio counties. On Wednesday, April 4 Perdue will visit locations in Allen and Mercer Counties and on Thursday, April 5 he will be in Greene County, the U.S. Department Agriculture (USDA) announced Wednesday. During the RV tour, which also includes stops next week in Michigan and Kentucky, Perdue is expected to hear ideas and concerns from local farmers, agriculture students and researchers, business owners, community leaders, and U.S. Department of Agriculture (USDA) employees. Secretary Perdue will also be joined by Administrator Linda McMahon, the head of the Small Business Administration (SBA), for part of the tour. The tour runs from Tuesday to Friday. Central State University (CSU) in Greene County is one of the stops Thursday, April 5. 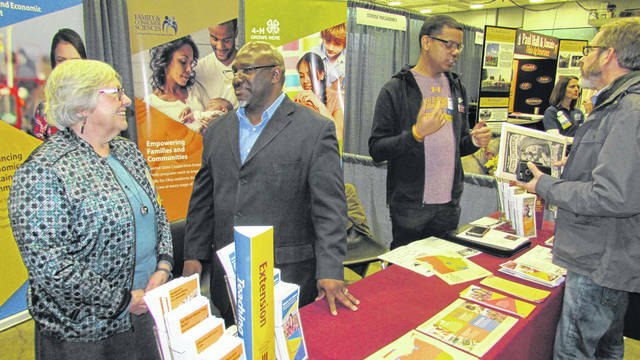 “It is remarkable that for the second time in four years, a U.S. Department of Agriculture Secretary has been to CSU,” said Dr. Clarence Bunch, Associate Director of Extension at Central State. “Secretary Tom Vilsack was here in (October) 2014 when Central State received the historic 1890 Land-Grant University designation,” said Bunch. This designation led to CSU Extension’s creation. Bunch said it was the leadership of CSU President Dr. Cynthia Jackson-Hammond that led to the interest in the program and visits by the two Secretaries of Agriculture. He added that the CSU Extension-sponsored Minority, Women and Small Farmers’ Conference will be held on the campus the next two days after Perdue’s visit, April 6-7. Secretary Perdue and Administrator McMahon will tour Amherst Greenhouse, 10 a.m., 644 County Road 126, Harrod. After this tour, Perdue will take part in a working lunch and conversation with McMahon, the Lima Chamber of Commerce and Ohio Farm Bureau. This townhall event starts at 11:30 a.m., at the City Club, 144 South Main Street, 3rd Floor, Lima. Later, Perdue and McMahon will tour Celina Tent in Mercer County to see their manufacturing facilities and the tents made for disaster relief. This event is scheduled for 1:45 p.m. at Celina Tent in Celina. On Thursday, April 5, Perdue will visit the Miami Township Fire-Rescue facility in Greene County and meet with township officials and first responders. USDA’s Office of Rural Development is assisting the construction of this 17,000-square foot building to house the Miami Township Fire and Emergency Medical Services (EMS) Department. This event, located at Miami Township Fire-Rescue, 225 Corry Street, Yellow Springs, is scheduled to start at 8 a.m.
Perdue will then visit Central State University where he will take a guided tour of the university’s (CSU) College of Engineering, Science, Technology, and Agriculture and participate in a roundtable discussion with CSU agriculture students. This event is scheduled for 9 a.m. at CSU, 1400 Brush Row Road, Wilberforce. Perdue was appointed Agriculture Secretary by President Donald Trump in January, 2017.
https://www.fairborndailyherald.com/wp-content/uploads/sites/50/2018/04/web1_CSU-Extension.jpgGary Brock | AIM Media photo Associate Director of Extension at Central State University, Clarence Bunch, center, talks with EFNEP Cooperative Extension Coordinator at CSU Mary E. W. Kershaw, left, at the CSU Extension booth during the Ohio Ecological Food and Farm Association conference Feb. 16, while CSU Montgomery County Extension agent Kevin McGhee, at right, talks with a conference attendee.